Fonte Sole has been central to the community of Nuvolento, near Brescia in Lombardy, Italy since the independent family-operated business was founded in 1906. Many legends are associated with the ancient Source, known since Roman times, and near where Benedictine monks founded a monastery. The well-balanced group of minerals in Sole is derived from a natural filtration process as the water works its way through varying geological rocks and minerals to the underground and well-protected Source. The Source is situated at the foot of the Brescian Pre-Alps that rise to the northeast of Brescia. The water from the Source emerges at “Via Antica Fonte” in Nuvolento and corresponds to the point at which the limestone-dolomite formation meets the alluvial deposits from the valley of the river Chiese. The delicious tasting natural mineral water is celebrated in particular for its very low sodium content and for being classified as ‘oligo-minerale’ (naturally low in minerals). It is an alkaline water that is clean tasting and slightly sweet. The sparkling has a soft and gentle carbonation. 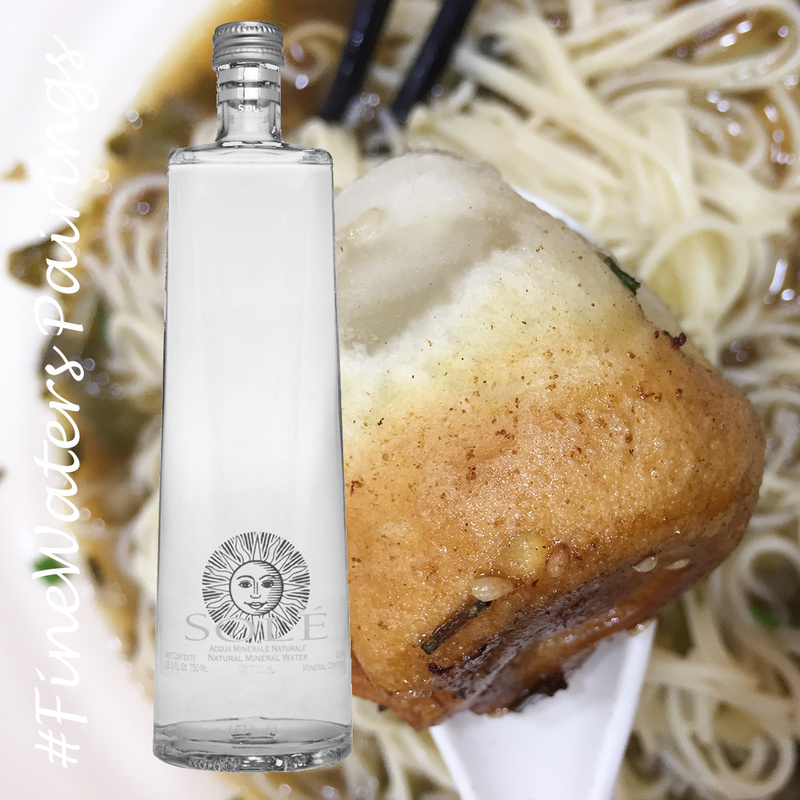 Known since Roman times and famous for its health-giving properties during the middle ages, the history of Sole is rich with story and folklore celebrating the famous source. Legend has it that a pagan sun goddess once stood at the site of the Sole source located in the foothills of the mountainous Alpine region of Italy. Roman soldiers would stop to fill their water vessels at the source before going out to conquer new lands. The pure water source became known as Sole, named for the sun itself. 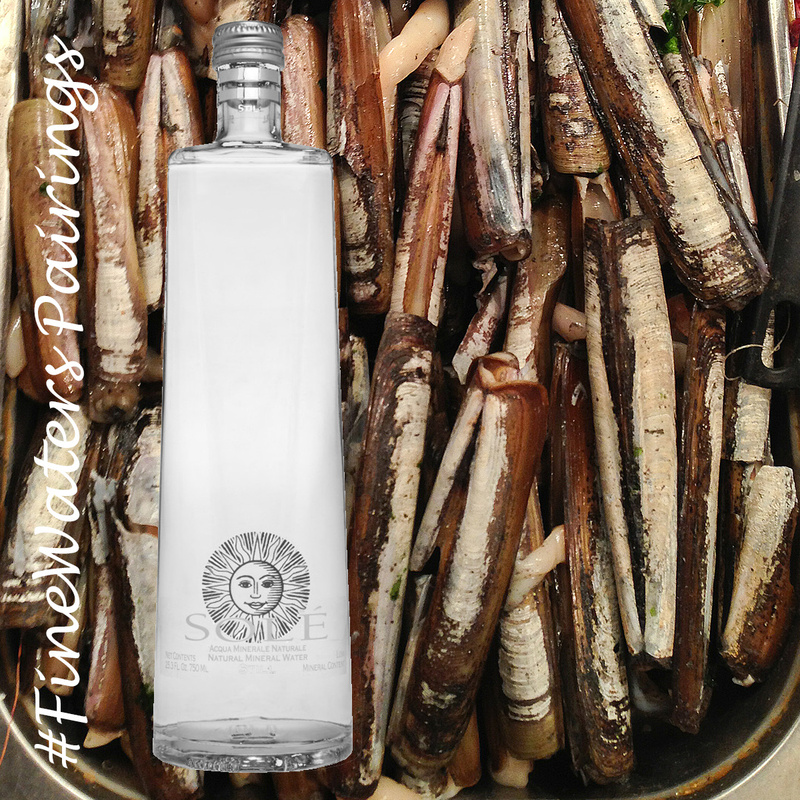 Razor clams are one of my favorite seafood and with a strong flavor and interesting texture I would recommend a still water with mediaum Minerality like Sole from Italy.